17 | June | 2015 | Troy C. Wagstaff aka CallahanWriter Blog: Topics of interest include Western Historical (1865-1899) Topics. Additionally inspirational Christian and Fibromyalgia interests. The story takes a look at the spiritual side of Connie Bricker Shaler and her poor health spanning a twenty-eight year period. It is her spiritual journey. “A Voice of Hope” doesn’t read like a journey at all. It reads like a Christian self help book or a Christian devotional book. The key words printed on the back cover imply it is being marketed as a Christian devotional book. As such, it is a good book. Sadly, it doesn’t talk that much about her depression and Chronic Fatigue. Based on how this book was presented to me and based on what the back cover said, I went into the book looking for a story of a person and how sick they were with depression and Chronic Fatigue. How did those illnesses affect her ability to carry on or did those chronic illnesses interfere with relationships, work, mothering, etc. I expected those ideas to be the subject of the book since depression and chronic fatigue were mentioned as much as they were. I need to say up front that this book is worth the read. It is thought provoking and inspiring. However, I was disappointed because it referred very little to how her spiritual journey affected her illnesses. Her journey was inspiring, but I would like to have seen how her journey was affected, step by step. I would like to have had her explain how her CFS affected her daily living over time and how, during the flare ups, her spiritual encounters helped her. There is only a little story behind some of the narration and reflections and then it isn’t in any chronological order. So enough bashing, because that’s what I feel like I’m doing. I don’t want to come across as bashing the book because it is a good Christian devotional book and if you go into the book properly prepared, I think you will find it enjoyable and inspirational. I think she should do a book or ebook with just her poetry. 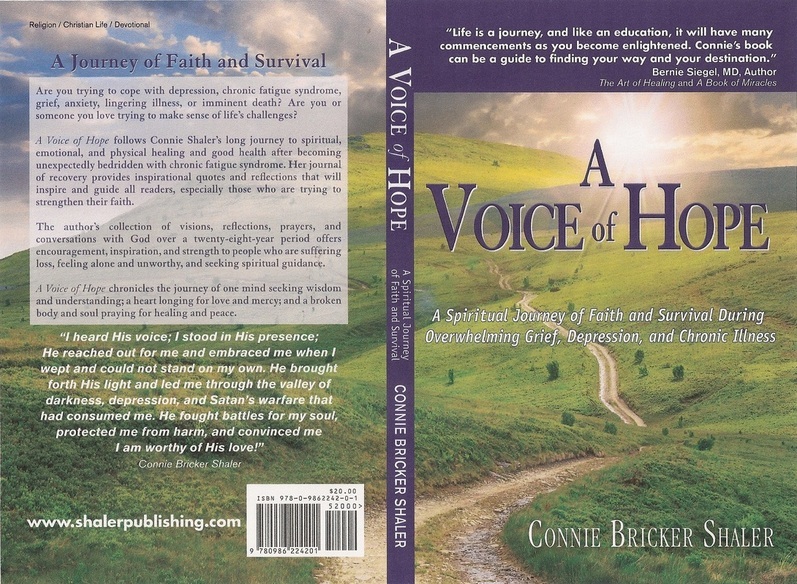 When I realized “A Voice of Hope” wasn’t what I expected, I didn’t put it down or throw it out. I kept reading. I read it like a devotional book, no longer looking for the correlation between her illnesses and here spiritual journey. My copy of the book has my handwriting in the margins and many sentences highlighted or underlined. I was inspired by many of her thoughts and touched by many of her poems. I have some new outlooks on different aspects of my journey with fibromyalgia and chronic fatigue syndrome. Her typical format is to start of a section with some narrative, an occasional original poem and then some related quotes and then a reflection box which often summaries that section and asks probing questions getting you to think about what you have just read. Often those reflections encourage you to think and apply her ideas in your life. She includes many of her poems and they are very good. Her narration is good also. The book is laid out nicely and it’s got a good readable font. Its 179 pages. I should have been able to read it in a few hours, but it took several days of reading to get through it because it caused me to think and ponder. It was an inspirational book more than it was an entertaining book. The only real complaint is that for me, it would have been nice to have her narrative and poems interspersed with the chronology of her illness so we knew how she was feeling and what she was thinking about at the time certain events happened. It would also be nice to know how life and her chronic illnesses are doing at this later stage in her life. I endorse this book wholeheartedly and recommend reading it from the standpoint of being a Christian devotional book more than anything else. I would lovingly encourage her to get it on ebook at an affordable price because this book as the ability to touch and inspire many people, both with and with chronic illnesses.